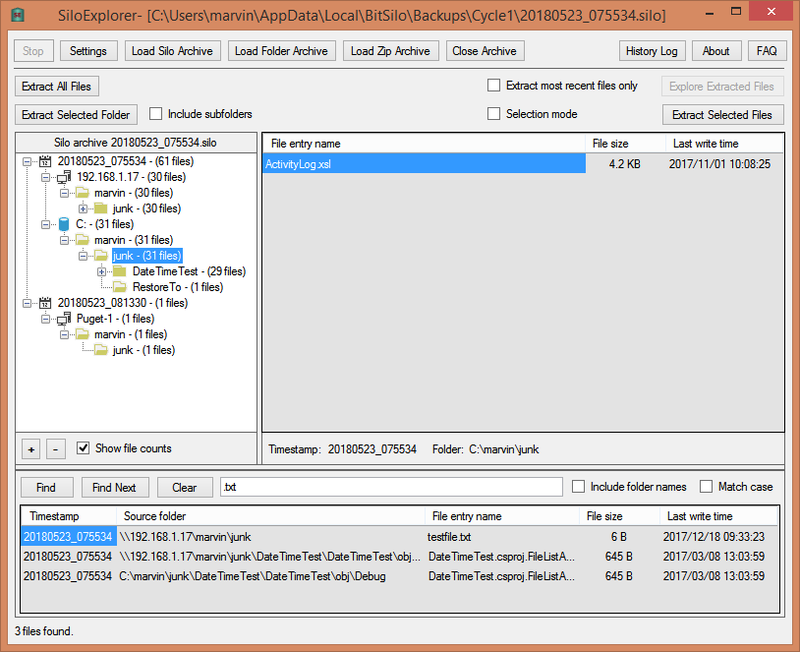 Backup files automatically; Find/Restore files easily. Check out the 60-day free trial! Current Version: 1.2.7.0, released December 31, 2018. 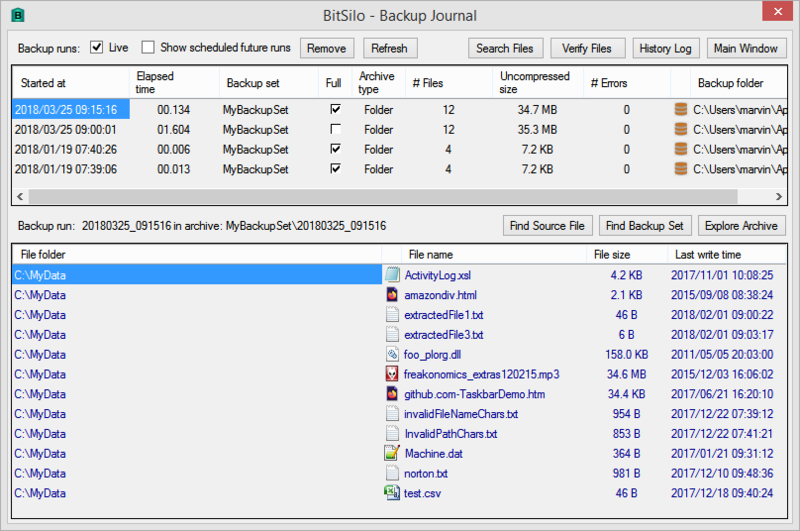 BitSilo is a Backup/Restore program for Windows. NEW! - Free utility SiloExplorer can open any BitSilo archive (from any computer) and extract files. NEW! - Use Silo archive format for highly efficient backup/restore. 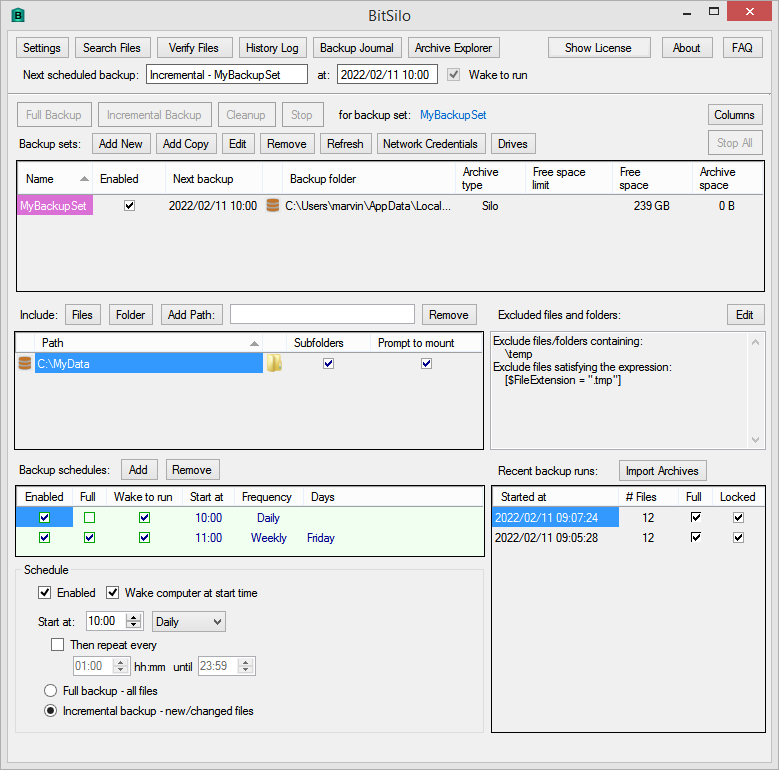 Creates timestamped backups for files and directories you specify. Create multiple backup sets, each containing a different set of files or directories to be backed up on a daily/weekly/monthly schedule. 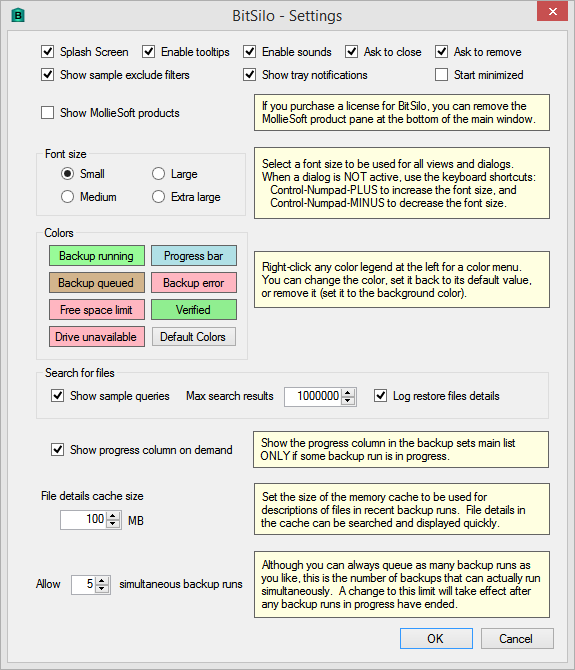 Create a full backup to save all the specified files; create an incremental backup to save only those files that have changed since the last backup. Exclude files from the backup using any part of the file folder or name. Flexible management of disk space used by backup archives. Restore files from any backup using a query language to find files. Backup files can be stored in a BitSilo "Silo" format for efficiency, or in a normal folder, or as a zip file. Automatic removal of old backups; cleanup rules govern which recent backups to keep. Verify (compare) files in any backup against the original source files, either automatically after each run, or at any later time. 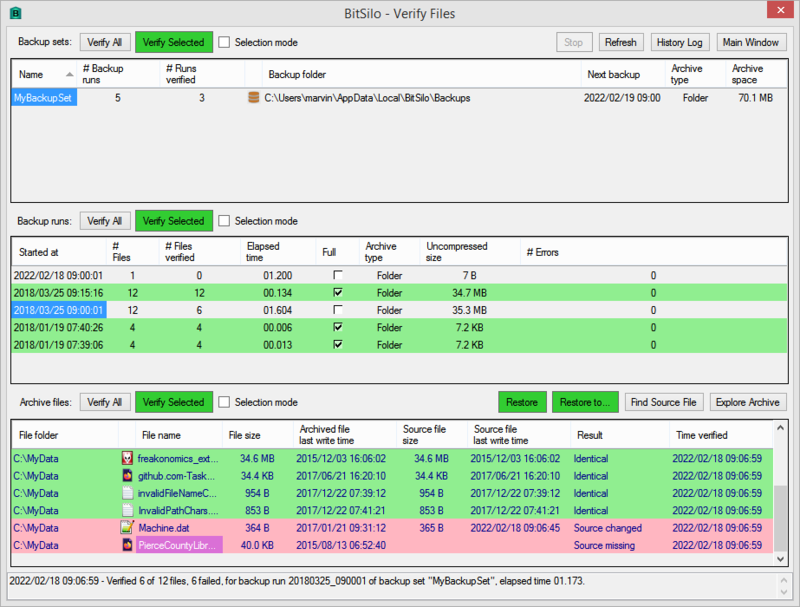 Use the free utility SiloExplorer to access any BitSilo archive (from any computer) and extract files from it. Try BitSilo free for 60 days! 1.2.7.0 - No schedule can run while a dialog box is open. 1.2.6.0 - Allow a backup schedule to repeat periodically after the start time, within any scheduled day. User can now specify folder credentials for other machines on the network. Schedules should not be run for a disabled backup set. Added "ask to close" and "ask to remove" settings. 1.2.5.0 - Fixed bugs involving source files on a network path. 1.2.4.0 - Various performance optimizations for very large backup runs; various stability fixes. 1.2.3.0 - New Silo archive format for highly efficient backup/restore. Verify archived files against original source files. 1.2.2.0 - Some message box fixes. BitSilo © 2018 by Marvin Hymowech.